Tuesday, October 9, 7:00 p.m. The area of Toronto east of the Don River has always had a rich, distinctive history. Its industries, its neighbourhoods, and its community institutions have all sustained a large working-class population. Come out to hear fascinating reports on three projects that explore that history, focusing on industry, health care, and community journalism. Heritage Toronto conducted research into the rich history of this part of Leslieville. They reached out to thousands of people who lived, worked, and sometimes played in the Dundas and Carlaw area, and heard from couples who met while working at the Carlaw factories and from entire families who were employed in the neighbourhood. Earlier this year Heritage Toronto unveiled a heritage plaque and accompanying self-guided walking tour to honour this history. Ward 7 News was a community newspaper that circulated in Ward 7 (roughly the east downtown and Riverdale) between 1970 and 1985. 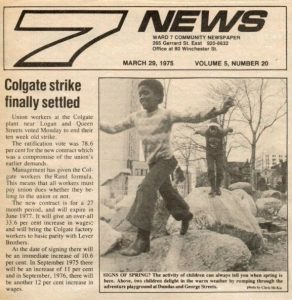 Reporting on the everyday triumphs, struggles and anxieties that concerned residents in a largely working-class area during a period of intense social and economic change, the staff at Ward 7 News captured a version of the 1970s and 1980s that was not visible from city-hall. The project is a digital teaching resource based on this paper. The presenters willl describe how local stories can inspire interest in history by connecting students with the social/built space around them. The South Riverdale Community Health Centre has been providing a wide range of accessible health care services to the area’s working-class residents since 1976. Since its creation, the Centre has played an important role in safeguarding the health of both residents and the community, from “Get the Lead Out” campaigns to the creation of one of the first safe injection sites in Toronto. Monday, September 17, 7:00 p.m.
Steelworkers’ Hall, 25 Cecil St.
Toronto has been home to Indigenous peoples for thousands of years, including the Wendat, Haudenosaunee, and most recently the Mississaugas of the New Credit First Nation. Today, it remains home to many Indigenous people from across Turtle Island. 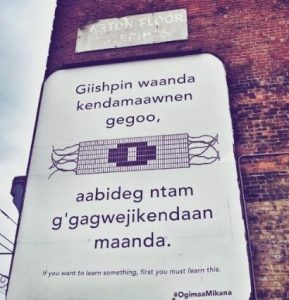 – Zachary Smith (Anishinaabe), PhD Candidate in Indigenous history at the University of Toronto. Please save the dates for the fall line-up of TWHP monthly meetings! Make sure to stay tuned to the website and/or mailing list for more information. We also invite you to attend the TWHP co-sponsored book launch for Christo Aivalis’ The Constant Liberal: Pierre Trudeau, Organized Labour, and the Canadian Social Democratic Left on Wed, Sept. 26 at 7pm at Steelworkers Hall. Full details here. Wednesday June 13, 7:00 p.m.
Children in this country once started work for their families or their bosses at a young age. In some parts of the world they still do. June 12 is World Day Against Child Labour, and TWHP is holding a meeting the next day to explore child labour in the past and present. Derek Blackadder, former CUPE national rep and Canadian correspondent for LabourStart, will discuss the issues of child labour in the global south today and the efforts to combat it. A short play about the struggle to root out child labour in Toronto in the 1880s and the important role of the Toronto labour movement. From our 9 January 2018 meeting on the history of Kensington Market, with the Kensington Market Historical Society. From our Oct. 10, 2017 meeting on migrant workers in Toronto and Canada. From our Oct. 10, 2017 meeting on migrant workers in Toronto and Canada. Video of other presentations to follow soon. Originally published on Active History on 4 October 2017. Republished here with permission. In Canada, these messages have drawn attention in particular to migrant farmworkers, who in various Temporary Foreign Worker Programs (TFWPs), represent a crucial component of the country’s agricultural labour force. In the spirit of joining the Thanksgiving shout-out to farmworkers, in this post I share two finds from the archives, uncovered in the course of my research on the history of tobacco farm labour in Ontario, in which senior federal bureaucrats in the 1960s and 1970s issue some eerily prescient warnings about what TFWPs might become in the future. 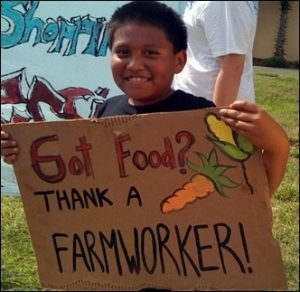 Example of a “Thank A Farmworker” sign. First, a bit of context. While the history of migrant labour can be traced back centuries in Canada, state-managed guestworker programs have been a permanent fixture since the mid-20thcentury. In agriculture, the most important program has been the Seasonal Agricultural Workers Program (SAWP), founded in 1966, which brings workers from Mexico, Jamaica, and other Caribbean countries to work on Canadian farms. TFWPs – which comprise a large number of employment visa regulations and foreign labour schemes, including the SAWP – have come under fire in recent years by activists, academics, and politicians. Migrant justice advocates have criticized the structure of programs, under which migrants in practice have far fewer rights than Canadian workers. Migrant labour scholar Adriana Paz has referred to this as a system of “labour apartheid.” In the SAWP specifically, migrant workers are barred from unionizing in Ontario (by far the biggest receiving province), have almost zero access to permanent residency, often face dangerous work conditions and subpar living arrangements, and find that their employers have almost unchecked control over their immigration status. 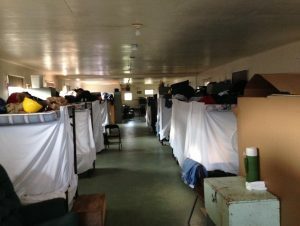 Complaining about conditions on the job or in the bunkhouse can often result in summary deportation and exclusion from future participation in the program. The number of migrants arriving in Canada in TFWPs grew rapidly under Stephen Harper’s Conservative government, though much of the groundwork for these programs was laid during Liberal administrations. In recent years, Liberals have criticized Conservatives’ running of the programs, arguing that what started out as a small, tightly-managed mechanism for alleviating temporary labour shortages had ballooned into an uncontrollable behemoth, easily abused by employers seeking cheap labour. This was never how this was supposed to work, the Liberals and Justin Trudeau have essentially said. Any problems that have arisen are simply the result of Conservative mismanagement. Two letters at Library and Archives Canada complicate the Liberal portrayal of TFWPs. Written respectively in 1962 and 1974, they foreshadow some of the problems that would emerge in TFWPs in later years, suggesting that these issues are not simply managerial or administrative. Rather, they are structural, something that has been apparent to observers – including those within government – since before the programs even began. “I am frank to say that I would not touch that one with a ten-foot pole. This is not immigration, but rather the importation of contract labour-gangs on a sort of indenture basis. These gangs of men are brought in to the U.S. under bond to ensure their eventual departure; they are shipped from one farm area to another like the old harvester gangs, fed and bedded in makeshift accommodation; and when they are paid they do not receive their wages in person, but have to agree to most of it being sent back to their families in Jamaica. I looked at the proposition in 1960, when I was still new on the job, and was at first attracted to the idea: but, when I found out more of the details, I quickly saw that it was not the sort of manpower operation I could recommend as a proper part of any immigration programme.”[Emphasis added]. Davidson’s fears about what a Canadian farmworker program might look like were justified: many of his horrified comments about the U.S.-Jamaica guestworker program in 1962 could easily be applied to the 21st-century Canadian SAWP. Workers are required to leave the country immediately upon termination of their contracts; accommodation is often poor (see image below); and a “mandatory savings” program in which the Jamaican government withheld 25% of wages until workers returned home was only eliminated in 2015. In case you needed convincing of substandard accommodations, this is the bunkhouse where a Jamaican friend of the author’s lives for 6-8 weeks per year while working at a canning plant near Chatham. Bathrooms and a dining hall are in separate buildings. Photo taken on 26 August 2017 and is courtesy of Edward Dunsworth. The second letter, written in 1974, is an internal memo within the Department of Manpower and Immigration, sent from Jean W. Edmonds, Assistant Deputy Minister for Immigration, to her boss A.E. Gotlieb, the Deputy Minister. In the memo, Edmonds expressed a number of concerns about the development of agricultural guestworker programs in Canada. She made it clear that her worries were not about the operation of the SAWP up to that point: “It is not the past but the future that concerns me.” Edmonds had two major preoccupations: first, she argued that it would be difficult to maintain separate streams of immigration – permanent and temporary. Second, she worried about how TFWPs might harm the government’s reputation, both at home and on the world stage. On the first point, Edmonds’ concern partly emerged from an organizational conundrum in which the “Manpower” and “Immigration” functions of the Department were split into two separate divisions. Edmonds argued that this was problematic; matters such as guestworkers, which were usually handled by the Manpower wing, could not be so easily separated from Immigration. She wrote: “I do not believe we can divorce ‘offshore workers’ and ‘employment visas’ from Immigration policy simply because they are matters of temporary rather than permanent entry. As all countries discover, temporary sometimes tends to become permanent unless there is a method of ensuring that this does not happen.” While temporary labour programs have become strikingly permanent in Canada, Edmonds’ worry about temporary people becoming permanent has not come to fruition. In fact, the last part of the quotation, “unless there is a method of ensuring that this does not happen,” is rather chilling to read, given the Canadian state’s remarkable effectiveness in ensuring that permanent residency has not happened for many guestworkers, and has been especially unattainable for farmworkers. Workers in the SAWP can toil in Canada for 10, 20, 30 or more years, and never receive any easier access to permanent residency. They are of course free to apply through the same channels as other prospective immigrants, but the low levels of education for most farmworkers and lack of English or French fluency among Mexicans typically make obtaining sufficient points an unrealizable dream. Other barriers have been erected to make access to permanent residency difficult for non-SAWP workers too. The issue of temporary migrants becoming permanent residents connected to Edmonds’ second concern. She explained: “Attempts to ensure the return of temporary workers when their work permits have expired can, unless carefully thought through, attract the unfavourable attention of the Civil Liberties Association and similar groups, and be a matter of strain between Canada and the country of permanent residence.” Here, Edmonds was spot-on in her vision of a possible future. The more draconian aspects of TFWPs – including the four-in, four-out rule – have indeed been an impetus for widespread criticism and resistance – not just from civil society groups, but from workers themselves. In addition to negative attention from the Canadian public, Edmonds thought TFWPs might cast an unfavourable light on Canada on the world stage. Here, she demonstrated some of the cool calculations that have gone into Canada’s cultivation of a progressive image. Having recently attended a United Nations Forum on World Population, Edmonds reported that “The social consequences of the practice of temporary migration for purposes of employment are becoming a matter of world wide concern.” In particular, “Third World Countries” were apprehensive about brain drain and the effect of temporary migration on families. Edmonds concluded that: “These considerations need to be taken into account in the light of Canada’s ‘humanitarian’ concerns about immigration.” Again, Edmonds’ fears were well-founded: Canada’s immigration policies, including on migrant labour, have repeatedly come under fire from various UN bodies, including the ILO, in recent years. While Trudeau and the Liberals continue to issue platitudes around improving TFWPs and providing pathways to permanent residency, very little has actually changed for the migrant men and women who harvest our food, clean our hotel rooms, and make our double-doubles. Documents like these tell us that problems in TFWPs did not spontaneously emerge during the Harper years, but instead are built into their very structures. Edmonds’ invocation of “humanitarian” concerns – in quotation marks – compels us to take the “sunny ways” language on TFWPs with a grain of salt (or perhaps some sunglasses) and remember that immigration policy – even of the “humanitarian” variety – usually emerges not from a place of genuine human concern but from a political calculus weighing both domestic and international factors. This Thanksgiving weekend, we do well to remember who produced the food on our tables and to “thank a farmworker” by doing something to ensure a better future for migrant workers than the ones predicted by Davidson and Edmonds – futures which have largely come to pass. 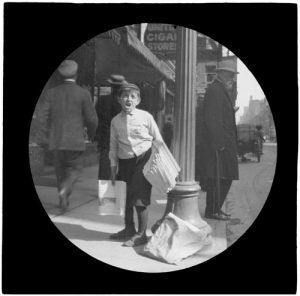 Edward Dunsworth is a PhD candidate in the Department of History at the University of Toronto and a member of the Toronto Workers’ History Project (TWHP). He invites anyone in the Toronto area to attend the upcoming TWHP event, Good Enough to Work, Good Enough to Stay: Migrant Workers in Toronto and Canada, on Tuesday, October 10th at 7pm at Steelworkers’ Hall. George F. Davidson to Charles E. Hendry, 30 July 1962, Department of Citizenship and Immigration, RG26, vol. 124, file 3-33-6, part 3, Library and Archives Canada. Jean W. Edmonds to A.E. Gotlieb, 9 April 1974, Department of Manpower and Immigration, RG118, acc. 1986-86/071, vol. 73, file 3300-1, “Farm Labour – General Series,” pt. 3, Library and Archives Canada. For ways to support migrant workers, check out some of the following organizations and get on their mailing lists: Justicia for Migrant Workers; Caregivers’ Action Centre; UFCW’s Agricultural Workers Alliance. There are of course many more organizations doing fantastic work – many are part of the Migrant Workers Alliance for Change and are listed on their website. Join us at Steelworkers Hall (25 Cecil St.), on Tuesday, October 10th at 7pm for a panel discussion – Good Enough to Work, Good Enough to Stay: Migrant Workers in Toronto and Canada. 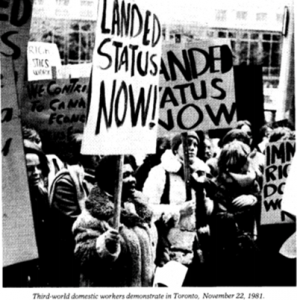 While characterized as “temporary” foreign workers, migrant workers have been a permanent part of Canadian workforces and communities for decades. The Caribbean Domestic Scheme began in 1955, the Seasonal Agricultural Workers Program in 1966, and the last two decades have witnessed a massive growth in the number of TFWs working in all kinds of industries across the country. While migrant workers have long faced structural oppression, they have launched many efforts to organize for a more just system of labour and immigration. Join us for this important discussion!